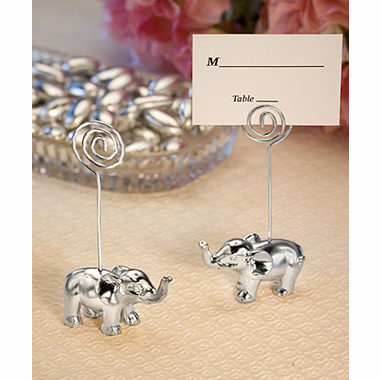 Charm your guests with the graceful style of these silver finish elephant placecard/photo holders as favors for Asian wedding favors, adult birthday party favors, family reunion favors, dinner party favors and more! 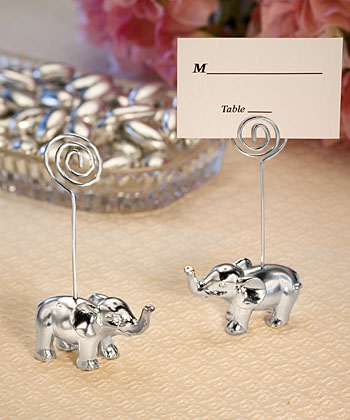 They say an elephant never forgets - your guests will love your style when they see these adorable place card holders upon finding their seating arrangements - and will be reminded for times to come of your gracious flair when they use them as photo holders or note holders. Each sturdy silver finish cardholder measures 4” x 2” x 1 ½” with an elephant base and wire coil extending above to hold the place card, note or photo. Each lucky elephant placecard favors come in an individual poly bag with place cards included.